For other uses of Allegheny, see Allegheny (disambiguation) and Allegany (disambiguation). The Allegheny River ( /ˌæləˈɡeɪni/ AL-ə-GAY-nee) is a 325-mile (523 km) long headwater stream of the Ohio River in western Pennsylvania and New York, United States. The Allegheny River runs from its headwaters just below the middle of Pennsylvania's northern border northwesterly into New York then in a zigzag southwesterly across the border and through Western Pennsylvania to join the Monongahela River at the Forks of the Ohio on the "Point" of Point State Park in Downtown Pittsburgh, Pennsylvania. The Allegheny River is, by volume, the main headstream of both the Ohio and Mississippi Rivers. 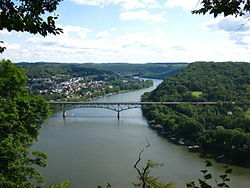 Historically, the Allegheny was considered to be the upper Ohio River by both Native Americans and European settlers. 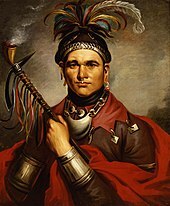 Indians, including the Lenni Lenape and Iroquois, considered the Allegheny and Ohio rivers as the same, as is suggested by a New York State road sign on Interstate 86 that refers to the Allegheny River also as Ohiːyo'. The Geographic Names Information System lists O-hee-yo and O-hi-o as variant names. The river is called Ohi:'i:o` (river beautiful) in the Seneca language. In New York, areas around the river are often named with the alternate spelling Allegany in reference to the river; for example, the Village of Allegany and Allegany State Park. Port Allegany, located along the river in Pennsylvania near the border with New York, also follows this pattern. 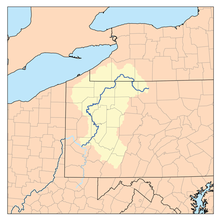 The Allegheny River drainage basin covers parts of New York and Pennsylvania in the United States. The river is approximately 325 miles (523 km) long, running through the U.S. states of New York and Pennsylvania. 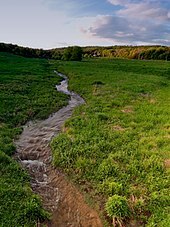 It drains a rural dissected plateau of 11,580 square miles (30,000 km2) in the northern Allegheny Plateau, providing the northeastern most drainage in the watershed of the Mississippi River. Its tributaries reach to within 8 miles (13 km) of Lake Erie in southwestern New York. Water from the Allegheny River eventually flows into the Gulf of Mexico via the Ohio and Mississippi rivers. The Allegheny Valley has been one of the most productive areas of fossil fuel extraction in United States history, with its extensive deposits of coal, petroleum, and natural gas. 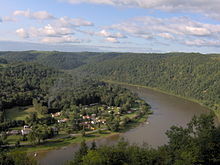 In its upper reaches, the Allegheny River is joined from the south by Potato Creek 1.7 miles (2.7 km) downstream of Coryville, Pennsylvania and from the north by Olean Creek at Olean, New York. Tunungwant "Tuna" Creek joins the river from the south in Carrollton, New York (flowing north from Bradford, Pennsylvania); the Great Valley Creek and Little Valley Creek join the river from the north at Salamanca, New York before becoming the Allegheny Reservoir. After re-entering Pennsylvania, the river is joined from the east by Kinzua Creek 10 miles (16 km) upstream of Warren; from the north by Conewango Creek at Warren; from the west by Brokenstraw Creek; from the east by East Hickory Creek at East Hickory; from the east by Tionesta Creek at Tionesta; from the north by Oil Creek at Oil City; from the west by French Creek at Franklin; from the east by the Clarion River, a principal tributary, at Parker; from the east by Crooked Creek southeast of Kittanning; and from the east by the Kiskiminetas River, another principal tributary, at Schenley. Buffalo Creek enters at Freeport, Chartiers Run enters at Lower Burrell, Bull Creek enters at Tarentum, Pucketa Creek enters near New Kensington, Riddle Run enters at Springdale, and Girtys Run enters at Millvale. Many additional streams enter or join with the Allegheny River along its course. Several locks were built in the early 20th century to make the Allegheny River navigable for 72 miles upstream from Pittsburgh to East Brady. The Allegheny River has eight locks and fixed-crest dams  numbered two through nine: Allegheny River Lock and Dam No. 2, 3, 4, 5, 6, 7, 8, 9 which form corresponding reservoirs. The river is also impounded by the Kinzua Dam in northwestern Pennsylvania, resulting in the Allegheny Reservoir also known as Kinzua Lake and Lake Perfidy among the Seneca. The Seneca Pumped Storage Generating Station is associated with Kinzua Dam. Numerous bridges and tunnels span the river throughout its course. The Allegheny River Tunnel, utilized by Pittsburgh Light Rail, went into service in 2012. In the latter half of the 17th century, control of the river valley passed back-and-forth between Algonquian-speaking Shawnee and the Iroquois. 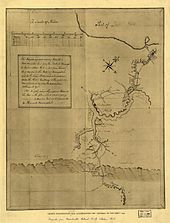 By the time of the arrival of the French in the early 18th century, the Shawnee were once again in control and formed an alliance with the French against the incursion of British settlement across the Allegheny Mountains. The conflict over the expansion of British settlement into the Allegheny Valley and the surrounding Ohio Country was a primary cause of the French and Indian War in the 1750s. During the war, the village of Kittanning – the principal Shawnee settlement on the river – was completely destroyed by British reprisal raids from Central Pennsylvania. Nevertheless, the British, after gaining control of the area in the 1763 Treaty of Paris, kept the area closed to white settlement, in part to repair and maintain relations with the Native Americans. After the war, the entire river valley became part of the United States of America. During the 19th century, the river became a principal means of navigation in the upper Ohio valley, especially for the transport of coal. Although the building of the railroads lessened the importance of the river somewhat, the lower river (navigable as far as East Brady, Pennsylvania through locks) has continued to serve as a route of commercial transportation until the present day. In 1859, the first U.S. petroleum was drilled north of the river at Titusville. One of the underlying premises of the Genesee Valley Canal was its connection to the river, opening a trade route from Rochester, New York to the west. The advent of the railroads obviated any interest Pennsylvania might have had in participating to improve navigation on the river. The canal was closed in 1877 and the right-of-way sold to the Genesee Valley Canal Railroad. In 1965, the completion of the federally sponsored Kinzua Dam for flood-control in northwestern Pennsylvania east of Warren created the long Allegheny Reservoir, known as Lake Perfidy among the Seneca, part of which is included in the Allegheny National Recreation Area. The dam flooded parts of lands deeded "forever" to the Seneca Nation of Indians by the 1794 Treaty of Canandaigua, and lands given to Cornplanter and his descendants. The event was described in the Johnny Cash song "As Long as the Grass Shall Grow" from the 1964 album Bitter Tears: Ballads of the American Indian, which focused on the history of and problems facing Native Americans in the United States. The construction of the dam and the filling of the Allegheny Reservoir also necessitated the elimination of the small village of Corydon, which was located at the confluence of Willow Creek with the Allegheny River; and the small village of Kinzua, which was located at the confluence of Kinzua Creek with the Allegheny River. All residents of both villages were forced to move. Many prominent individuals opposed the construction of the dam at that time because of the damage it would do to Seneca lands, including Pennsylvania Congressman John P. Saylor of Johnstown, and Howard Zahniser, executive director of The Wilderness Society and native of Tionesta—a small settlement located along the Allegheny River several miles downstream from Warren. During the campaign for the 1960 United States presidential election, John F. Kennedy assured the Seneca Nation that he would oppose the dam if elected. However, he failed to follow through on his pledge upon becoming president. ^ USGS Data Report 2009 Retrieved June 16, 2018. ^ "welhik". Lenape Talking Dictionary. Archived from the original on October 4, 2011. Retrieved December 14, 2011. ^ "Heckewelder here does not give the strict meaning of hanne. The word in common use among Algonkin [i.e., Algonquian] tribes for river is sipu, and this includes the idea of 'a stream of flowing water'. But in the mountainous parts of Pennsylvania, Maryland, and Virginia sipu did not sufficiently convey the idea of a rapid stream, roaring down mountain gorges, and hanne takes its place to designate not a mere sipu, or flowing river, but a rapid mountain stream." Russell, Erret (1885). "Indian Geographical Names". Magazine of Western History. 2 (1): 53–59. ^ Trumbull, J. Hammond (1870). The Composition of Indian Geographical Names. Hartford, Conn. pp. 13–14. ^ a b Stewart, George R. (1967). Names on the Land. Boston, Massachusetts: Houghton Mifflin Company. p. 8. ISBN 0-938530-02-X. ^ Zeisberger, David (1999). David Zeisberger's History of the Northern American Indians in 18th Century Ohio, New York and Pennsylvania. Wennawoods Publishing. p. 33. ISBN 1-889037-17-6. ^ a b "Allegheny River". Geographic Names Information System. United States Geological Survey. Retrieved 2010-05-13. ^ "Glossary of Seneca Words". Internet Sacred Text Archive. ^ MacCorkle, William Alexander. "The historical and other relations of Pittsburgh and the Virginias". Historic Pittsburgh General Text Collection. University of Pittsburgh. Retrieved 12 September 2013. ^ Allegheny Wild and Scenic River – Allegheny National Forest. Retrieved June 16, 2018. ^ Shuster, Patrick; Garrone, Francine (2008-08-18). "Ohio woman swimming length of Allegheny River". Pittsburgh Tribune-Review. Tribune-Review Publishing Company. Retrieved June 16, 2018. ^ Nephin, Dan (August 22, 2008). "Ohio swimmer completes 325-mile swim of Allegheny". Pittsburgh Tribune-Review. Tribune-Review Publishing Company. Retrieved June 16, 2018. Schafer, Jim; Mike Sajna (1992). The Allegheny River: Watershed of the Nation. University Park, Pennsylvania, US: The Pennsylvania State University Press. ISBN 978-0-271-00836-3. 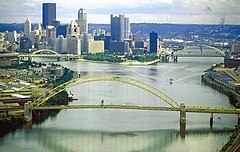 Wikimedia Commons has media related to Allegheny River.